From looking at the headlines over the last 24 hours you would think the UK is in the middle of a crime wave. ‘Violent crime is up 19%’ screamed the Metro. ‘Police data shows crime rising at increasing rate in England and Wales’ said the Guardian. ‘Crime rises by 13% in England and Wales, ONS statistics say’ said the BBC. Now US President Donald Trump has piled in tweeting today that “Just out report: ‘United Kingdom crime rises 13% annually amid spread of Radical Islamic terror.’ Not good, we must keep America safe!” Let’s put to one side the entirely spurious insinuation that there is any link between terrorist incidents and the overall crime rate, or that there is somehow a connection between the crime rate in the UK and public safety in the United States. Let’s focus instead on what President Trump has in common with the media sub editors: the idea that there has been a 13% rise in crime in the year to June 2017. Is crime rising in England and Wales? Overall, no. The ONS is clear that according to its most reliable measure of crime (the Crime Survey for England and Wales) the overall number of crimes fell by 9% in the year to June 2017 compared to the previous 12 months. So, where does the 13% rise in crime figure come from? There has been a 13% increase in crimes recorded by the police. For the avoidance of doubt that is not the same thing as saying that crime has risen by 13%. What it does mean is that of the overall amount of crime out there, more of it is being recorded by the police. Police recorded offences involving a knife increased by 26% compared to the previous year. This is likely to reflect a genuine increase in knife crime, around half of it in London, as it is a well recorded serious crime and is corroborated by NHS data. There was a 19% increase in sexual offences. This does not mean there is more sexual crime (there was no change in the CSEW measure). It rather mainly reflects improved recording practices and a greater willingness of victims to come forward. There was an 11% increase in police recorded theft. Some of that reflects a likely real increase in categories of acquisitive crime like burglary and vehicle theft which tend to be well recorded. For other areas of theft the increase is more likely to reflect improved recording practices. What about the long term picture? The chart below shows the long term decline in volume crime as measured by the CSEW. In overall terms there is no question that there are many fewer violent and acquisitive crimes in 2017 than there were in 1995, when crime reached its peak. There are two caveats here. One is that the CSEW did not previously pick up fraud and computer misuse offences. These are now included and the overall level of crime once those have been included is represented by the blue dot on the far right of the chart. 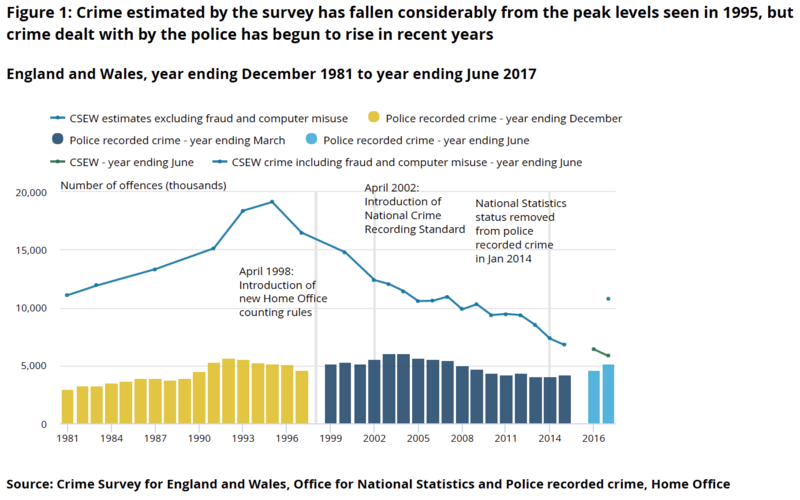 This shows that crime has fallen significantly since 1995, but not by as much as we thought and that a considerable amount has shifted online. The second caveat is that even if the overall number of crimes has fallen, that is not the same thing as saying that overall harm has fallen. This is because some crimes are more harmful than others. There is strong evidence that if you assess the harm caused by each offence, the biggest falls in crime have been among the less harmful offences. Is Labour right to say ‘Prolonged Tory cuts to the police have left our communities exposed’? If the claim is that police cuts have caused a rise in crime, then that would be hard to justify on the basis of these figures. There is little evidence of a relationship between the number of police officers and overall crime levels. However, where the opposition and the police unions are on stronger ground is where they say that cuts to police budgets (meaning fewer officers and staff) have put the police service under significant pressure at a time when demand on the police (note that is different to crime) is rising. 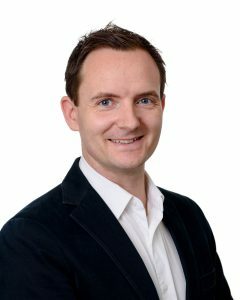 Increases in recorded crime may not reflect genuine increases in crime, but they certainly do increase the amount of work the police have to do.